Came across the Black Glutinous Rice Chiffon Cake quite often and was wondering where to get this type of rice. Finally, I decided to give it a try by grinding the black glutinous rice to bake the cake. The cake turn out very well [soft, fluffy and tasty]. How to grind the black glutinous rice? I measured 45 gm of black glutinous rice [in Malaysia, black glutinous rice is called Beras Pulut Hitam]. Grind it using the small grinder till fine. Then sift it and grind again the coarser grain a few more times until you get the quantity needed. Discard the coarser grains. I suggest that you grind more and store it for later use. This recipe is adapted from Happy Flour blog. Whisk egg yolks with sugar and salt till creamy. Drizzle in oil and whisk continously, then drizzle in coconut milk. Continue whisking while adding till creamy, then fold in sifted flour till well combined. Set aside while you prepare the egg white. Whisk egg white till frothy, then add in cream of tartar. Continue beating till foamy, then add in sugar in 2-3 batches. Whisk till soft peaks formed. Fold in 1/3 portion to egg yolk mixture till well combined. Then fold in to the balance meringue. Fold till well combined then pour into 7" chiffon cake pan. Tap pan on table top several times to release trapped air. Bake in preheated oven at 170 degrees C for 35 - 40 minutes. Invert pan immediately to cool cake before removing from pan. It's Sunday morning, woke up at 6.00 am and was preparing to go for my morning exercise. Suddenly, it started to rain and it's still dark outside. 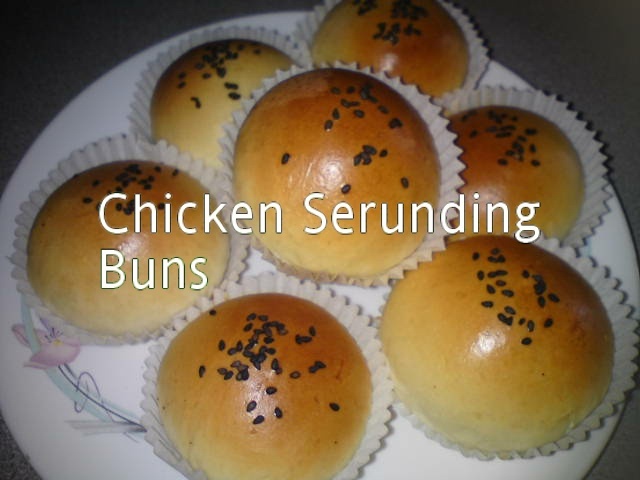 Too early to go marketing, so I decided to make these buns with Chicken Meat Floss [I think it is Chicken Serunding - a Malay dish]. 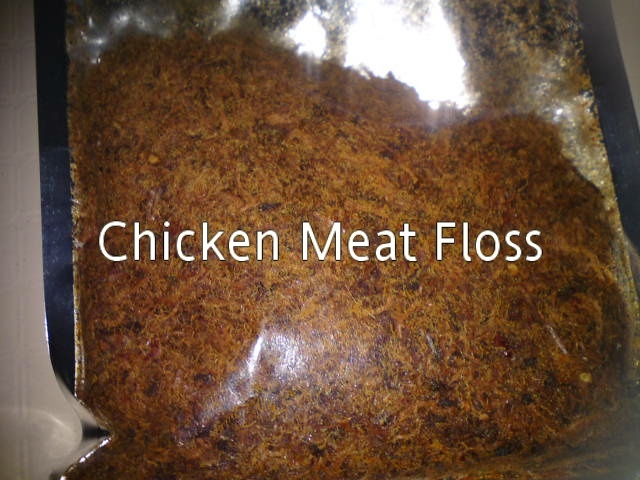 My sister's Malay colleague gave her a packet of this meat floss for Hari Raya celebrations and not knowing what to do with it, my Ma gave it to me. The easiest and fastest way to finish it is by wrapping them up in the buns. The buns turned out well and the meat floss was a real good match. It tasted like anchovies in sambal tumis, a little spicy and sweet. GOOD. ingredients, it is still okay. 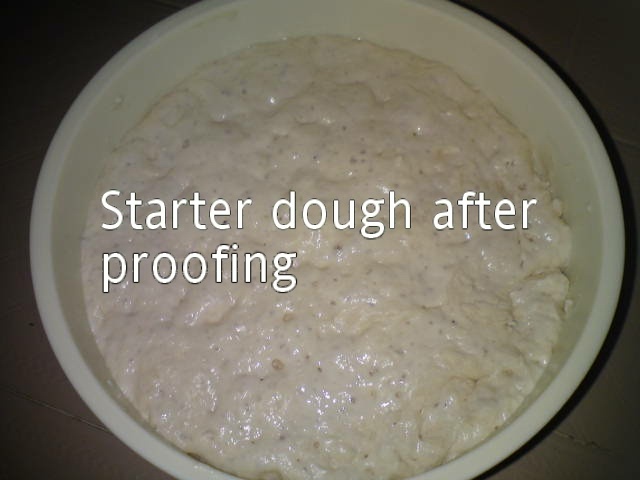 I mix the starter dough and measured the rest of the ingredients and went back to sleep till 8.00 am. By then the starter dough is ready for use. Add flour into the yeast mixture and mix into a sticky dough. Cover with a clean kitchen towel and leave for 1-2 hours or till it becomes about 2-3 times in size. [Usually, I will mix ingredients in an airtight container, leave it to proof for 30 minutes in room temperature, then cover the container and kept in the fridge overnight]. Mix bread dough ingredients with starter dough in a mixer with dough hook. Knead on medium speed for about 5-10 minutes till soft then add in butter. Continue to knead for another 10 minutes till dough is soft, smooth and elastic. Cover and leave to rest for 15 minutes or until double in size. Punch down dough. Divide dough into 2 equal portions for easier handling. Form into a ball, then roll on a floured board and fold into third. Then roll into a log and cut into 12 equal portions [10 if you prefer bigger buns]. Shape each portion into a ball. Then roll each ball into a flat round piece. 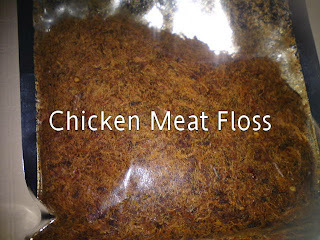 Add filling [chicken meat floss], pinch the seam to seal. Place the seam side down on paper casing or parchment paper. Do the same for the other portion. Leave to rise for 30 - 40 minutes. Brush with beaten egg and sprinkle with some black sesame seeds. Bake in preheated oven at 200 degrees C for 10-15 minutes. Remove to cool on rack immediately. 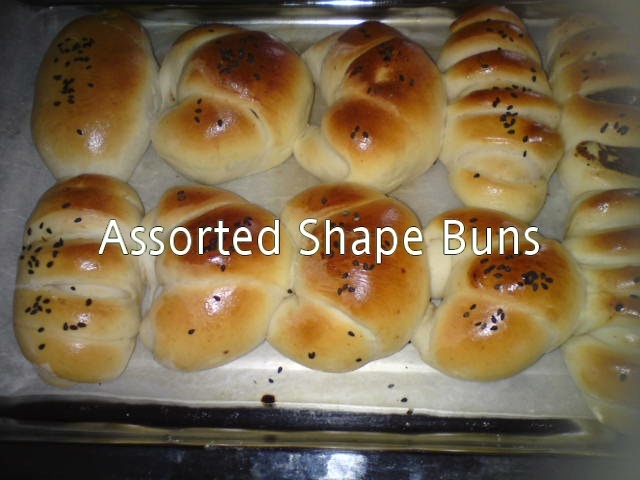 You can shape the buns into any shape you prefer [round, triangle, oval, oblong, swiss roll or nastar style]. Here, I made them into round buns and also swiss roll and nastar roll style]. But I think it is better not to expose the filling as it gets dried up when baking. the pictures do not look good but the buns are really good, soft and tasty even on the third day. Came across this dish on TV and wanted to try it out because the preparation is slightly different from the usual. 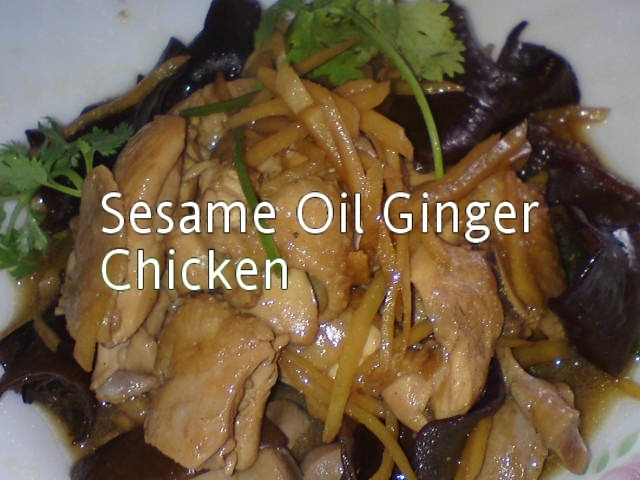 Shredded young ginger is used and not fried in sesame oil before adding to the chicken pieces. For the recipe here, I am giving the actual ingredients [but I substituted mushrooms with black fungus and spring onions with coriander leaves because I have not these 2 ingredients when cooking this dish]. I will definitely cook this dish again with the actual ingredients as it tasted good even even with black fungus and coriander leaves. I think with mushrooms and spring onions it will be more aromatic and fragrant served with plain white rice. 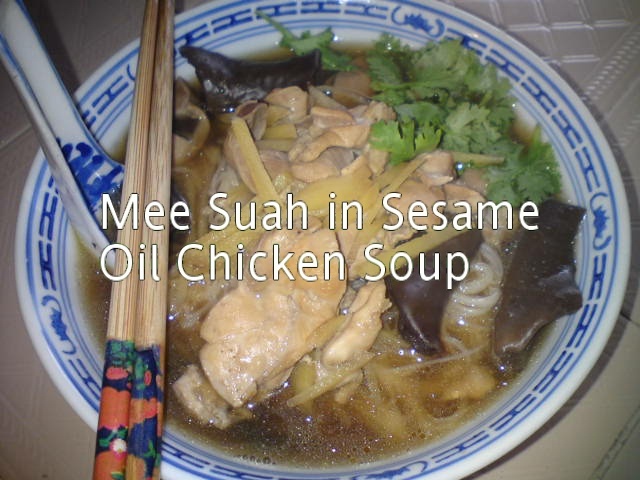 Later for my lunch with my hubby, I added more water [400 ml] to make this dish into a soup and serve it with blanched Mee Suah and vegetables as a 'One dish meal'. Heat up wok without oil. When hot, pan fry chicken pieces [skin side down] till golden. Turn over to fry the other side till firm. Add in sesame oil and white part of spring onion. Stir fry till aromatic, then add in wine from the side of wok followed by water. When water has boiled, add in seasoning to taste, then add ginger and mushrooms. Continue to fry and simmer till gravy is slightly reduced and chicken is tender. Add in spring onions as garnishing. Dish out on plate to serve with rice. Came across this bread recipe at Cosy Bake blog and I doubled the quantity because I am making 2 loaves at one time. Also used the starter dough method and the loaf bread turns out well. Soft and fluffy for 2 - 3 days. Mix all the ingredients together into a soft but rough dough. Cover and set aside to proof for 1-2 hours or till double in size. Add all bread dough ingredients [except butter and milk] to starter dough in an electric mixer fixed with dough hook. Knead on low speed to blend ingredients well, then gradually add in milk. Do not add all the milk if dough is already wet. Continue kneading till dough is smooth and soft [about 10 minutes] then add in butter. Continue to knead for another 10 minutes until the dough is smooth and soft again. Remove dough from hook and roll into a ball. Cover to proof for 15 minutes or until the dough has doubled in size. Punch down dough to release the air. Transfer the dough to a floured board. Divide dough into two equal portion. Fold into third for each portion. Set aside. Roll out each portion into a rectangular shape and roll up swiss roll style, seal the edges. Place in baking tin, cover and leave to proof for 1 hour or until the dough has doubled in size. Do the same for the other portion. Bake in preheated oven at 180 degrees C for 25-30 minutes. Remove from tin immediately to cool on rack after baking. This is the second time I baked this chiffon cake. Lovely/good cake. Got the recipe from Baking Mum blog. Whisk egg yolks with sugar till creamy, then drizzle in oil and milk. Continue to whisk till well combined, then fold in sifted flour. Lastly add in raisins and chocolate chips. Set aside. Whisk egg white till frothy, then add in cream of tartar. Continue whisking and gradually add in sugar. Beat till soft peaks formed. Fold about 1/3 portion into egg yolk mixture till well combined, then fold into balance meringue. Pour into a clean and ungreased 7" chiffon pan. Baked in preheated oven at 170 degrees C on lower rack for 30 - 40 minutes. Invert pan immediately after baking. Cool before removing from pan. 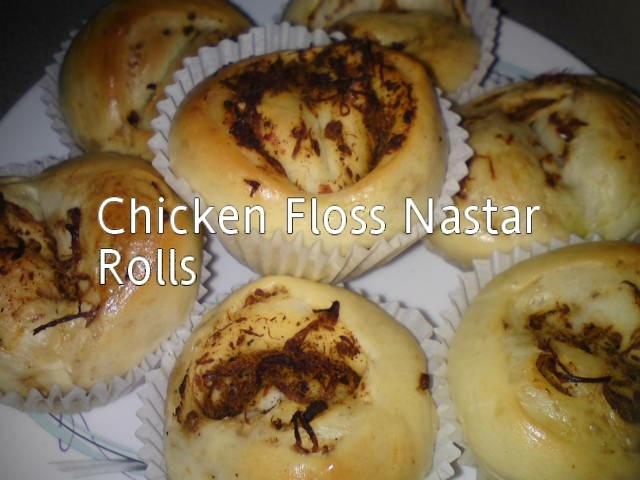 Came across this recipe in Small, Small Baker blog. Since I have some bananas at home, I decided to give it a try. Not too please with the result probably because of the cup cases used and the baking time. Should baked it for at least 30 minutes at 175 degrees C on middle rack. 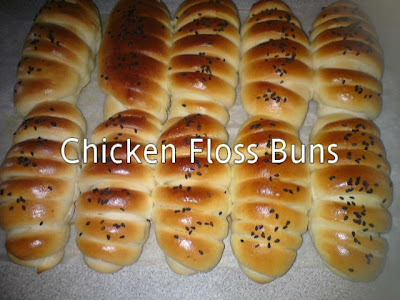 Makes about 20 pieces. Whisk egg yolks with oil till creamy, then drizzle in water. Continue to whisk till well combined and add in mashed banana. Whisk to combine ingredients well, then fold in sifted flour. Lastly add in diced bananas. Set aside. Fold about 1/3 portion into egg yolk mixture till well combined, then fold into balance meringue. Combined well then scoop into cup cases. Top with sliced banana as garnish. Baked in preheated oven at 175 degrees C on middle rack for 30 minutes. Remove to cool on rack. Note: Can bake in 7" chiffon pan at 170 degrees C for 35-40 minutes on lower rack. Bought a small tub of blueberry fillings but did not have any recipe in hand to make use of it. Came across this chiffon cake recipe in 'Peng's Kitchen' so just gave it a try. Really simple but not too happy with the colour of the chiffon cake. Just wondering why such a dull colour. Whisk egg yolks and sugar till creamy then add in oil, 1 tablespoon at a time. Continue whisking after each addition. Drizzle in the milk and whisk till well combined. Fold in the blueberry fillings and flour. Set aside. Whisk egg whites till frothy and add in cream of tartar. Continue whisking then add in sugar in 2-3 batches. Whisk egg white till soft peaks formed. Fold in 1/3 portion to egg yolk mixture till well combined, then fold in the rest of the meringue. Fold till batter is smooth. Pour into a 7" chiffon pan. Tap a few times to release trapped air. Bake in preheated oven at 170 degrees C for 30-40 minutes. Invert pan immediately after baking. Cool before removing from pan. Quite an easy chiffon cake recipe with ingredients available from a simple kitchen yet worth keeping. Recipe adapted from Cuisine Paradise but used tablespoon to measure some of the ingredients . Gave this cake to my Ma, so did not manage to get a picture of the sliced cake. Mix 3 in 1 coffee with instant coffee granules with boiling water. Set aside to cool. Whisk egg yolks with sugar, then add in corn oil, a tablespoon at a time. Continue whisking after each addition till well combined. Then add in coffee gradually, whisking as you add to egg mixture. Then stir in rum. Fold in flour to egg mixture till well combined. Set aside. Whisk egg white in a clean bowl till frothy, then add in cream of tartar. Continue whisking for a second and gradually add in the sugar. Continue whisking till soft peaks formed. Fold 1/3 portion of the meringue into egg yolk mixture till well combined. Then fold in the balance meringue till well combined. Pour into a clean 7" chiffon pan. Tap a few times on the table top to release trapped air. Bake in preheated oven at 180 degrees for 30-35 minutes. Invert pan immediately after removing from oven. Cool before removing cake from pan. Note: I added some chocolate chips to cake mixture before baking.